The Yealink VP59 Smart Video IP Phone is a professional phone that enhances collaboration in any executive office or huddle room. Featuring HD Video and cutting-edge audio, the VP59 is the perfect device to conduct video meetings and boost team productivity and performance. 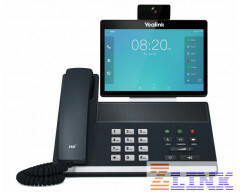 The Yealink T5 Series of Smart Business Video Phones includes the T58A, T58A with Camera and the flagship video phone the VP59. These are professional devices that are designed for desktop collaboration via video, content sharing and a wide range of features that are sure to boost productivity in the executive office or small conference room. The phones provide advance collaboration features for the business user and help improve productivity with functions that are designed to make the workday more efficient. A large backlit display with high resolution and LED indicators allow for the best viewing and navigation experience. Its fully adjustable display gives users the option to change the screen based on their needs at a variety of angles. This can be especially helpful when in a video call or when lighting conditions require a change of angle. The T5 Series can be used for content sharing and the higher end models support built-in Bluetooth and Wi-Fi (all except for the T53). The T5 series features Yealink's Acoustic Shield technology for distraction-free voice clarity. The technology uses multiple microphones to create a virtual shield between the speaker and the person on the other line. When enabled, it blocks out or mutes sounds that are considered to be outside the shield so that the person on the other end hears the speaker clearly. Because if the noise blocking technology the T5 series is great for noisy workspaces. The T5 series IP Phones can be paired with the Yealink DECT handsets via the DD10K DECT dongle. Users can pair up to 4 cordless handsets per desk phone creating a wireless solution with seamless call switching between the desktop phone and the cordless DECT handsets.